Create a modern conservatory that looks like nothing else available on the market. Our Ultraframe performance conservatory range will reward you with outstanding thermal performance when you choose super-insulated columns. The Performance Conservatory, otherwise known as the Loggia Conservatory, is manufactured by our market-leading partner of choice, Ultraframe. Choosing this conservatory style will reward you with incredible aesthetics and performance. What makes a performance conservatory installed by Fox Windows so different? Super-insulated columns add a sense of presence to the design, while improving internal comfort. Outstanding sightlines are created with a decorative cornice that hides the roofline. Fox Windows will build a performance conservatory to your precise requirements. We are Ultra Installers, which means we meet the criteria of Ultraframe’s assessment scheme. Our team covers Kenilworth, Leamington Spa, Warwickshire and the local areas – so contact us for advice and prices. Super-insulated columns can be built into the design scheme of your performance conservatory. Flat and fluted options are available; the latter of these will reward you with the modern look that you want. Ultraframe columns improve the thermal performance of brick piers of the same scale by 500% and can achieve a U-value as low as 0.16. Your performance conservatory won’t fail when exposed to extreme weather elements. Each installation is built using NASA satellite data that anticipates snow and wind loading in a customer’s area. Whether you live in Kenilworth, Leamington Spa - or any of the surrounding areas - your new conservatory extension will be built to last. 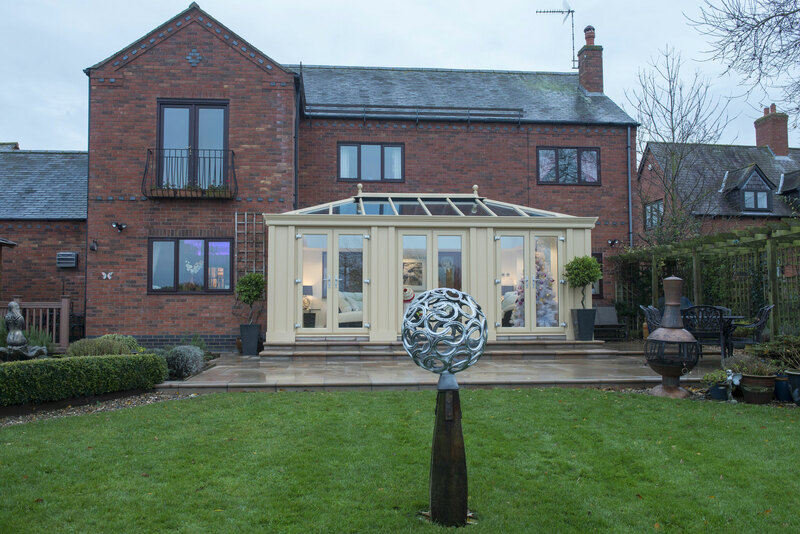 Your performance conservatory will look stunning when viewed from the outside. We can fit a flat decorative cornice that is compatible with most Ultraframe conservatory roofs - or a curved version that can be installed at a right angle and which works with all the systems that we sell. Why not use our virtual reality tool to look for yourself? The Performance Conservatory is compatible with two of Ultraframe’s most popular roof systems - the Quantal and Classic. Both these roofs feature hidden technology that allows wider pelmets and door spans to be included. Add bi-fold doors into your design scheme to really open up your space, fill it with light and create stunning views. The insulated pelmet that runs around the perimeter of your performance conservatory will prevent warm air escaping. By addressing this critical area of heat loss, your roof will ensure your room is cosy year-round. During warmer weather, thermally efficient glass will prevent your conservatory from overheating and becoming uncomfortable. Your roof will work with most of the popular building styles. If space is limited and you need a small conservatory, you can choose a lean-to shape that fits neatly under the eaves. If you have lots of garden space, a P-shape conservatory that provides two distinct areas might suit your design requirements better. Ask for details when contacting us. You want your new performance conservatory to create an impact, but without overpowering the architectural style of your home. Fox Windows will help you choose from a wide palette of colours to locate a scheme that suits your design ambitions. Your conservatory will tie-in with the themes and schemes of your property in full. Whether you want a conservatory or orangery, it’s important to make your new room feel like a natural extension of your home. We can add a central lighting panel that will make your performance conservatory feel cosy during the evening, while also acting as a feature that will catch the attention of anyone who comes to visit. Visit our dedicated VR tool to take a virtual tour of any of our Ultraframe products. You’ll be able to enjoy a 360° view and click on individual features to find out more. Making a buying decision has never been easier. You can even get a price from the comfort of your armchair by building your desired Ultraframe product using our online tool. We install a wide range of Ultraframe products for customers throughout Kenilworth, Leamington Spa and the surrounding areas. We meet the requirements of Ultraframe’s Ultra Installer scheme in full and are members of Which? Trusted Traders. You can deal with us with confidence, knowing we’ll make your project a success. Our thermally efficient performance conservatories look stunning and will reward you with market-leading performance. Design yours now and get an online quote. Our performance conservatories will change the way you live at home and are a beautiful addition. If you would like to know how much a performance conservatory will cost, get in touch today. Our online quote engine will be able to offer you a guide price for your conservatory style. If you have a technical question – or want to get a performance conservatory quote over the phone – please contact us for more information today.